Classroom management is a hot topic for teachers - it's vital for keeping a classroom running smoothly, but can be tough for new and veteran teachers alike. Today I want to share with you some details about my whole-class management plan. 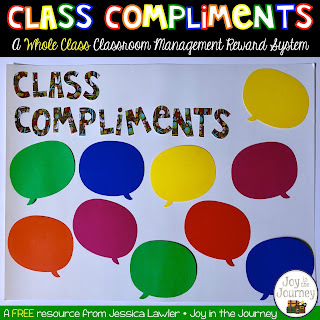 My students worked as a class to earn Class Compliments. To earn Class Compliments students have work together as a class to earn "compliments" from me (the teacher), from specialists (gym, art, music, etc. ), or from other adults in the building. The kids LOVE earning compliments...and they hate losing them. If the entire class is not demonstrating exemplary behavior (i.e. excessive chatting, noisiness in the hallway, horsing around in the classroom, etc.) then a compliment "falls" from the board. Once they earn 10 compliments, they've earned a PARTY! Some party ideas: reading in-tents (read more about that here), popcorn, extra reading time with their Reading Buddies, extra recess, free time with board games, etc.